(CNN) -- Capt. Chesley Sullenberger, the hero pilot who safely landed a full passenger jet in the Hudson River, was once again honored with cheers and applause Tuesday during a ceremony for him hosted by the governor of his home state. Gov. 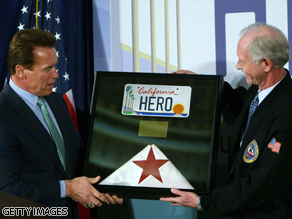 Arnold Schwarzenegger gives hero pilot Chesley Sullenberger a flag and license plate. California Gov. Arnold Schwarzenegger, first lady Maria Shriver and other dignitaries greeted Sullenberger at the state Capitol rotunda in Sacramento. Taking a break from difficult negotiations over a troubled state budget, the governor presented Sullenberger with a jacket with the state seal, a California state flag that had flown over the state Capitol, a proclamation and a "California Hero" license plate. "Today is a very important day," Schwarzenegger said. "There are legislators upstairs that are negotiating and working on a budget -- [we] need a great hero in a state capitol." The Sullenberger family lives in Danville, California. Sullenberger's response was understated -- as it has been at other ceremonies, including a New York City Hall event when he was given the key to the city by Mayor Michael Bloomberg. "On behalf of the other four crew members of Flight 1549 and also on behalf of the many thousands of aviation professionals whose daily devotion to duty keeps air travel safe, I gratefully accept this recognition," he said. Sullenberger and his crew safely landed the damaged airplane, believed to have hit a flock of birds, in the Hudson on January 15. All 155 passengers aboard the US Airways flight survived. CNN's Scott Thompson contributed to this report.